Kitchens are often where we showcase some of our finest designs. They allow us to combine the aesthetic with the practical, and that makes them the crown jewel of interior design. But, as with all designs, kitchen design trends come and go. Still, every year we see some designs that are just too good to let go. That’s why we have put together this list of our favourite kitchen design trends in 2018. These trends are taking off in Australia, and we think it isn’t hard to see why! 2018 kitchen cabinet colour trends: here are our favourites! Cabinet colours: colour schemes always lead the way when it comes to design trends. And this year, we are seeing some brilliant uses of kitchen cabinet colour schemes. But of these, our favourite is probably the matte-neutral look. This look is understated, yet elegant; cosy, yet modern; and above all else, practical! As easy as it is to stick with the gloss look, matte colours have a little extra depth to offer in a lot of cases. However, they do absorb light. That means they can make your kitchen seem a little smaller – hence the cosy effect! Splashbacks have a strong basis in practicality – they keep oil and grime from leaving a permanent mark on the kitchen wall. But just because they’re practical, splashbacks don’t need to be plain or boring. 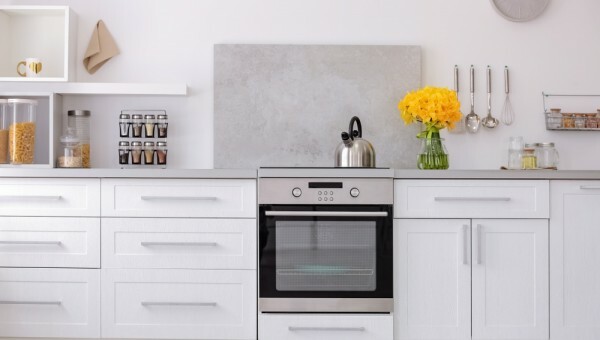 In 2018, we have seen some incredible kitchen splashback trends. These range from natural stone, to stainless steel. But probably the most popular is the subway tile. Subway tiles are so named for a reason: they first took off in subway stations. And that is because they look good, and they’re as tough as nails – the perfect combination for a kitchen splashback! Minimalism was the calling card of last year’s kitchen design trends. But no sooner than it came, it left – replaced by the emerging, and fantastic, eclectic design trends. Eclectic kitchens are a little mismatched, a little odd, and completely brilliant! Think farmers’ sinks, open shelf storage, hanging hooks, and some natural timber cabinetry – all are a match made in heaven. Remarkably, too, this haphazard approach to storage not only looks great, but also improves the overall storage capacity of your kitchen. Speaking of storage, it has become the focus of many 2018 kitchen design trends in Australia. Storage is a vital component of any kitchen – for understandably practical reasons. That’s why we are so happy to see designers turning storage into a statement piece – while maintaining its function. Custom cabinetry and a more open approach to kitchen storage is seeing a small revolution take place in the world of kitchen design trends. And we are pleased to report that the side effects are entirely positive! Finally, let’s talk space – or rather, the illusion of space. Let’s face it: not all kitchens are massive. With apartment living on the rise, a lot of us are making do with a little less space than you might see in the design magazines. But that doesn’t mean we need to forgo our dreams of beautiful kitchen designs. And that’s where kitchen design trends are getting creative with light. Lighting is perception, so effective lighting can make kitchens feel larger and more spacious than they are in reality. Good lighting can also accentuate the features of your kitchen, and emphasise certain aspects of its design. For more great design trends in 2018, get in touch with Marshall Renovations.